The Kansas City Chiefs suffered a double loss Friday, falling to the Seattle Seahawks 26-13 in the team’s Week 3 preseason game, and also losing RB Spencer Ware to an unspecified knee injury early in the game. Ware managed only three carries (for 15 yards) before leaving the game. In his absence, rookie Kareem Hunt carried the ball nine times for 39 yards. On the Seattle side, Russell Wilson and Austin Davis threw for a touchdown pass each, and RB Eddie Lacy managed 5.3 yards per carry across four rushes. With that. we give you our PFF exclusive takeaways from the contest for each team. 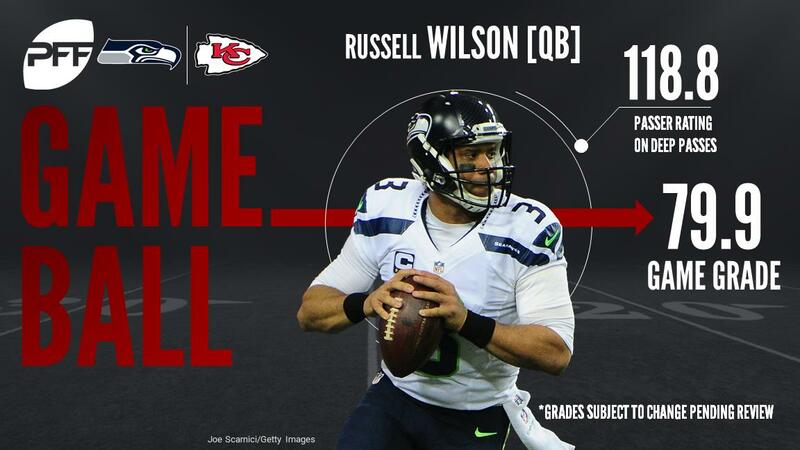 Wilson didn’t end the game with the highest overall grade, but his performance made him an easy choice for the game ball. Compiling a 110.96 PFF passer rating, Wilson completed 13-of-18 aimed passes for 200 yards, one touchdown, and an outstanding 74 percent of that yardage coming before the catch. On deep (20-plus-yard) passes, Wilson connected on 4-of-5 for 131 yards. Already in midseason form, the Seattle offensive line will likely prove to be the catalyst that either makes or breaks their season. While fellow RB Chris Carson continues to impress the Seattle brass, McKissic made quite an impression Friday night — albeit against second- and third-string defenders. Regardless, McKissic produced 45 yards, and broke a pair of tackles on seven carries. He also caught both of his targeted passes for 21 yards, 18 after the catch, and averaged 2.10 yards per route run on 10 snaps in route. Marsh tied for the team high in snaps with 38, and played well against both the run and pass. He posted a QB hit, two hurries and beat his man on multiple other occasions, and also posted two stops. Clark played just 17 snaps, but it seemed as if he were in for significantly longer because he was constantly in the backfield. He notched a sack, two hits and a QB hurry, on his way to a pass-rush grade of 77.9 on the night. Completing just 7 of 17 throws looks awful for Smith, but he received little help from the cast around him. His receivers dropped five balls, and he also threw two passes away and had another knocked off course by a hit he took during his throwing motion. His adjusted completion percentage skyrockets up to 85.7 for the game, third-best among QBs thus far in week three. On a night with little positive to say about the offensive line play, at least the Chiefs got a strong performance from Fulton. He did not give up a pressure on 18 pass-block reps, and posted a strong run-blocking grade of 76.5, albeit on limited reps (just six snaps). With such an impressive overall grade, the only factor that held Jones back from the game ball is a lack of snaps (26). His play made it entirely clear that he had total control over the Seattle offensive line. In addition to an impressive sack, Jones collected a pair of run stops, and tallied a 25.0 run stop percentage. Jones is on the right track to draw attention to his play, and the Kansas City decision makers must be extremely happy they selected the former Bulldog in the second round of the 2016 draft. Acker generated the Chiefs’ top overall grade thanks to posting a pair of pass defenses, and only permitting 1-of-3 responsible targets to be completed. Acker had an up-and-down rookie season out of Southern Methodist in 2016, but with an 0.44 yards per coverage snap average and 85.6 coverage grade, Acker may very well be on his way to a breakout season.